Eco Fashion Week Australia celebrates again a mindful, sustainable and innovative approach to fashion. On its second year, the eco-focused event has expanded to the opposite sides of Australia, taking place in Queensland from the 4th to the 10th of November, as well as in Western Australia, from the 15th to 21st of November. Luxiders Magazine will travel to Perth to cover the event in Western Australia. 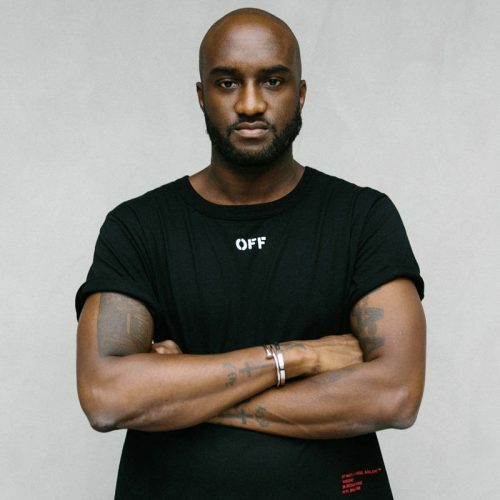 Here is our insiders guide to the designer shows, awards and events. See you there! A young fashion week for a young country. Eco Fashion Week Australia turned on the lights last 4th of November to surprise us with the chicest ethical designers from around the globe. The event is also hosting pioneering events for a like minded stylish and eco-fashion forward community. After the runways in Queensland (4th to 10th of November), the event funded by Zuhal Kuvan-Mills, will arrive to Western Australia on the 15th of November. Luxiders Magazine will be there! The Gala Night will be a fabulous opening event, featuring guest speakers, designer previews, music and dancing. There will be also a hot ticket with Studio Membrane finale. Designer Hiroaki Tanaka wowed with his braided Behind Useless Shape collection in 2017. The Claws of Clothes 2018 collection promises now to be a show stopper, introducing a revolutionary resin textile developed by heating wool. This night also will mark the presentation of the first Merino Wool Design Award. The challenge is to create one special garment from 3 metres of Merino fabric. Ten students and six eco designers from Western Australia are competing for the win. What better way to start fashion week events than with a spot of swapping. Fashion Swap will run daily with morning and afternoon sessions (15th - 18th November). 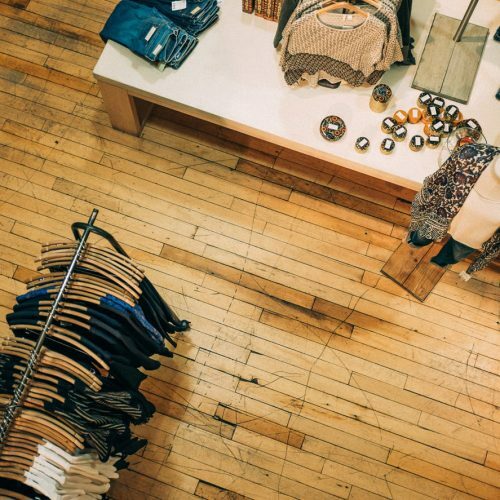 Bring 10 items and shop the swap. It is a great sustainable way to pick up a piece or two to wear at the events and runway shows over the next few days, an exciting opportunity to let go some of your pieces to make room for something new. If you love the idea of a wardrobe refresh go all in and check out Fashion For Oceans (15th - 18th November). Bring all your treasures and sell on Freemantle's High Street. No market style early starts, bring your suitcase, it's so easy and the rack is provided. The opening show will be in the hands of Ku'arlu Mangga (Good Nest) Nhanda Community Art Group. Known for their strong, vibrant textile range designed by indigenous artists, the collection includes retro dresses and men's shirts, accessorised with hand made creations. Next up on the catwalk will be Clawdi's new collection: Recycled Revolution. It is composed by handmade pieces from up-cycled materials, fusing glam rock, punk and disco -using iconic Australian and New Zealand wool blankets re-imagined and re-purposed. Promising to be loud and full of bright exuberance, anticipation is high to see this show. Next on the show, Beads 'N Pods, will show beautiful innovative jewellery and accessories. Using recycled coffee pods to create sophisticated eco fashion, these delicate up-cycled treasures were once considered waste. This is a "must-see" in creativity and re-invention. Next down on the runway will be The Water Hyacinth collection by Zuzanna Hrubos. She makes a statement of equilibrium for modern technology and nature. Her collection includes eco prints made with dry laser and reflective printing. Accessories are made from roots of the water hyacinth. Natural materials are in harmony with our health and nature. Her designs are like the softest breath on skin. Nikelby Designs will offer light versatile Alpaca weave fabrics complemented with silk and wool. Coming from farm to fashion (from designer Angela Betharas's 67 acre farm, home to 50 Alpacas), the designer is creating colourful structured dresses, tops and skirts. Every piece is unique, a one off piece of artwork, made for the woman who wants to stand out, no wall flowers here. Leah Kelly By Design will show handmade organic glam, customised heirloom pieces. Made using reclaimed fabrics from hemp/silk, bamboo and 100% hemp and pineapple fabrics, beaded, embroidered and embellished with shells, precious stones and crystals, this will be ethereal elegance floating down the runway with rainforest spirit. 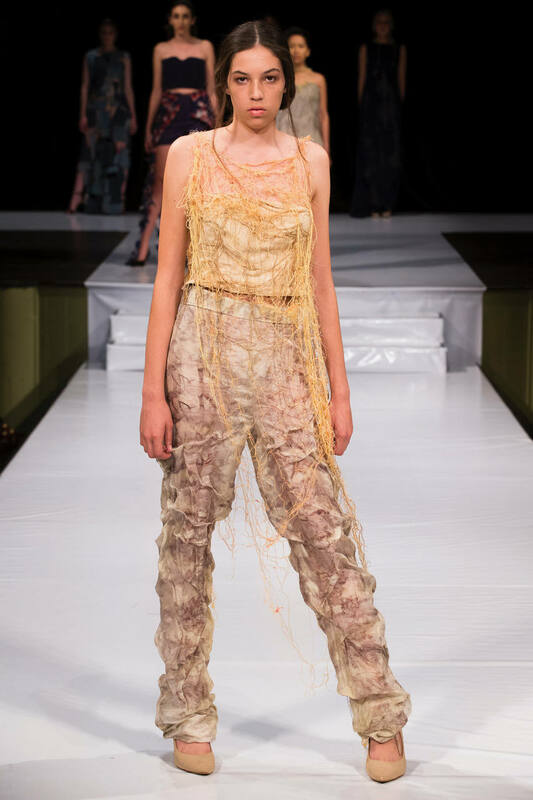 Her designs, inspired by living off the grid in the Kurand rainforest, give much inspiration for expression through thread. Francesca Phipps will be next on the runway. Her signature style is feminine and spontaneous, thanks to star bursts of colour and beautiful printed fabrics. Focused on up-cycling and using recycled fabrics, Francesca references her artist fathers work in recreating and customising fabrics. She offers classic silhouettes with a modern twist on layering, painted colours and volumes. Fashion forward and unexpected, Phipps is one to watch. The breath taking finale to Runway Night 1 is sure to be Green Embassy. Australia's first internationally recognised organically certified fashion label founded by designer Zuhal Kuvan-Mills, is breaking all fashion rules. The new collection focuses on endangered animals. Inspired by the IUCN Red List of threatened species, native to Western Australia, the collection palette features only black and white. The pieces are constructed from the finest silk organza, organic cotton, alpaca and merino wool, complemented with fabrics sourced from op shops and old curtains. The designer makes a statement on the balance between power and fragility juxtaposing light and dark. Creations are made with the lightest touch and with the greatest meaning. Yes, Kuvan-Mills possesses innate skills to translate cultural and environmental concepts to directional collections. 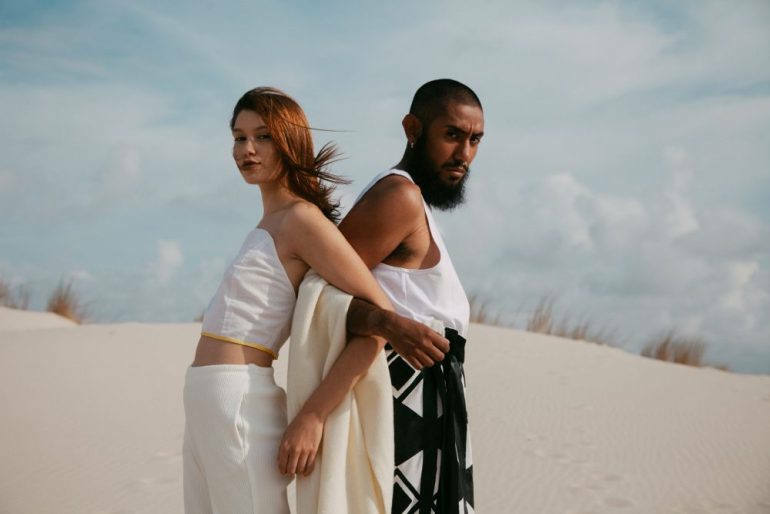 Designing sublime handmade couture dedicated to sustainability and zero waste, Kuvan-Mills has become a driving force in Australia's Eco Fashion movement. So do not miss this show!! It will be the best colophon of the day. - Sass Brown is a self described writer, blogger, researcher, educator, curator, nomad and designer. She is the Founding Dean of Dubai Institute of Design and Innovation (DIDI). - Cr. Rachel Pemberton. City Ward Councillor for Fremantle since 2011, is currently working for Senator Scott Ludlam on Sustainable Cities. - Clare Press, author, journalist, sustainability advocate and presenter of podcast series Wardrobe Crisis, Clare is Vogue's first ever Fashion and Sustainability editor. - Jeff Hansen, Director of Sea Shepherd Global. He is also the Managing Director of Sea Shepherd Australia. "Working with Governments, industry and Interpol to bring patrols, justice and enforcement for the ocean". - Marina Chahboune is the founder of Sustainability Consultancy Beyond Fashion. She is an expert in sustainable textile production, innovations and circular economy principles. - Jane Milburn is a sustainability consultant and author of Slow Clothing. 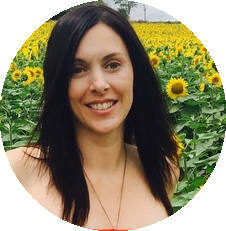 - Nicki Colls is a Sustainability Engineer and co-founder of Fibreshed Melbourne, a not for profit organisation connecting local textile communities via slow fashion. - Dr Anne Farren is Senior Lecturer and Academic Coordinator. She is the Head of fashion studies at Curtin University. Chair of the Perth Fashion Festival Advisory Board since 2016. She is also a Member of international editorial Advisory Board for Journal of Textile Design Research and Practice. We are sure this is going to be an enlightening and lively panel discusion, an important conversation for those with passion on sharing sustainable beliefs and practices. Next up on the list of must do's for EFWA is stopping by the Mending Workshop. Learn the lost art of mending with skilled textile tutors who can pass on great tips and tricks to fix a garment. Your beautiful Linen blazer has lost a button, has a pull or hole? Don't throw it away, it's an easy fix! Come and learn from skilled sewing masters. "A stitch in time saves 9". Donate to attend and Mend the Reef one stitch at a time with Reef Restoration Foundation. The first designer show this evening will be Skylark The Label. Inspired by ancestral links to her Nordic Heritage, Sheridan Joyce has created frothy colours, conscious designs and nordic values. On the catwalk, she will show her third collection: Nordlys, influenced by the long periods of night during the Norwegian winters and the phenomena of the Northern Lights. Skylark embraces a transeasonal aesthetic with layering of fabrics. The collection uses silks, wool, cottons and recycled polyesters discarded by local businesses. Next on the show is Ngali: "Together we are strength, growth and unity. Together we create". Ngali shares stories of the country through clothing and fashion, uniting the talents of a group of emerging indigenous artists who work together to produce art, clothing, collectibles and homewares. The inspiration is Gum Trees, a fascination of the power and true beauty of all trees. Images of trees printed on silks, cottons and wool tell a unique story of the tree and its location. 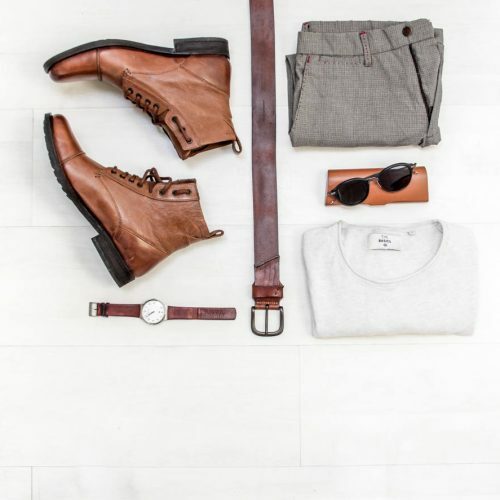 The designs follow clean lines and classic styles. After Ngali comes the ECU Student Runway. 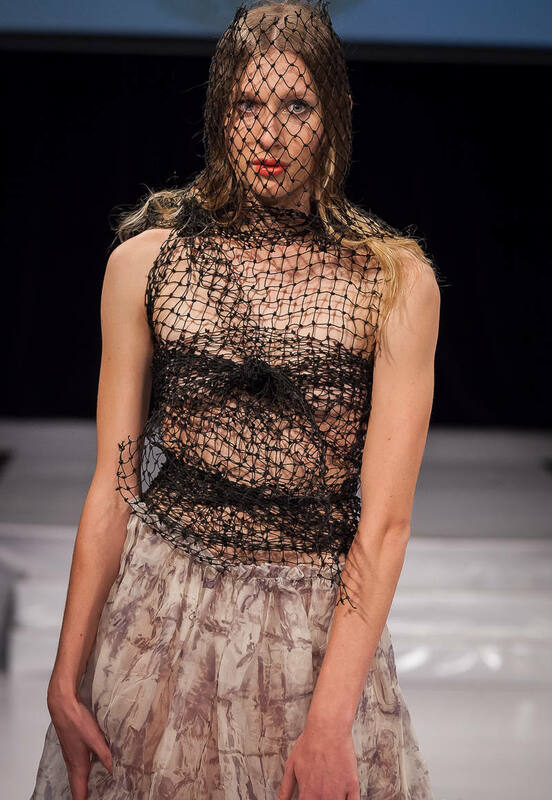 Student designers from Edith Cowan University will display their innovative and creative designs. Next down on the catwalk is Classic Couture Vintage Bridal, outstanding bespoke pieces made with silks, linen, cotton and wool, using reclaimed and gifted fabrics to produce an eclectic mix of bridal gowns. Her designs references are Elizabethan, Renaissance, Pre-Raphaelite and Regency/Edwardian periods. These creations are sure to be intricate heirloom pieces treasured for generations. Known for her superb bespoke, refashioned and altered garments, Satisha (The Shire Seamstress -"Saving the world one stitch at a time") is the next in the schedule. This year, her collection will display traditional and modern wedding gowns, shaped from refashioned vintage fabrics, lace and trims using eco-dyed fabrics. The pieces are a reflection of the "heart and soul" of the woman wearing it and embodiment of love. Gemini Kite creates pieces for an outback princess. Using up-cycled silks, natural fibres, plant and eco dyed fabrics in garments, her designs blend and mirror the environment. The techniques and layering utilised sing in perfect harmony with natural landscapes. Sylvia Calvo is a "must-see" on the runway. Original and elegant, one look at her designs and you can identify her pieces. Up-cycled coffee bags work perfectly with organic cotton, silk, natural dyes, embroidery, and Nuno felting, all in a well cut tailoring. This witness coffee bags transformed into stylish and chic must have fashion pieces are just wonders of the upcycling fashion scenario. Kicking off night 3 is Jude Taylor. Offering transeasonal clothing that is not part of fast fashion, her classic pieces will be fashion love stories for years to come. The fabric features signature prints inspired by Western Australian wildflowers. Garments are made from cottons, bamboo and silks, with a spectrum of colours from the Australian landscape. Expect big, bold and colourful prints from this designer. Curtin University Student Runway will be next on the runway. It will show designs from the best and brightest upcoming student designers. NoRuYeLo ("No Rubbish Yes Love”) believes on slow fashion, versatility, uniqueness, personal style and individual expression. Utilising re-used textiles destined for landfill and creating unique individual garments, his key design principals are multi-purpose, different ways to wear and style unique pieces. This is a not for profit social enterprise with fierce design game. Marita Moreno will show distinctive sculptural and artistic designed clothing, accessories and her vegan shoe line. Pieces celebrate the Portuguese designer’s heritage. The latest SS18 collection is an up-cycled line made from leftover materials. The premium line offers products belonging to a limited set of 100: they are unique and exclusive. The label will also shows high quality bags that are hand made by craftsman, hand woven by certified artisans. Barbwire Noose will show a collection made from organic cotton, bamboo and hemp materials. Designer Marcia Hobbs likes to play with volume, layering and clean lines. This is a label dedicated to Making 'A Better World™' . Each piece is crafted with a personal touch. In this show we will see "raw creativity", a new take on recycled plastic bottles turned into felt material. Sustainable Couture is a collective of designers, most living in Alice Springs, creating one off unique, stylish and sustainable pieces from pre-loved clothing. Up-cycling, embellishing and re-fashioning pieces into clothing, accessories and homewares, this years collection “Edge of Centre” celebrates the desert spirit. Made from natural fabrics, linen, indigo dyed silks and printed cottons, it will show an eclectic mix of abstract patterns and references to ancient cultures. The last show of the night will be Connally McDougall’s. Known for tailored real life clothes featuring trademark pockets, the new collection Talisman is a twist on classic tailoring. The collection is inspired by personal tragedy and pays homage to familiar heritage. Using organic cottons, recycled textiles, faux leather and hand dyed fabrics, this season also launches jeans in an easy fit for real women. Talisman aims to "take real women from home to work to cocktails with classic core pieces". A Zero waste label that's made for all sizes. This has been a fashion packed week full of fabulous design and innovation. The vibe? Inspired, consciously cool and stylish sustainability. Talented students, ingenious Designers, the new eco kids on the block have arrived. The final runway night of Eco Fashion Week WA is going out with a bang. Opening the show, we will meet Melaleuca Rise. This designer expresses the essence of individuality by connections to pieces personalised by your individual heritage, providing an emotional link to your life. The 2018 Fragmented Memories collection explores moments as designs that are the fabric of your life. Things of Substance - "A touch of Occidental vibe in Hanoi" will present crisp designs with embroidered details. This label epitomises simple style, less is more, through a neutral palette with pops of colour, classic pieces with pleating, draping and embroidery. MOLA is a Latin American sustainable fashion platform composed by four designers from Uruguay and Argentina. Cerrito de Indios, Maria Bouvier and GAIA will send creations down the runway. Their aim is to promote fashion as a motor for change, a conscious lifestyle and awakening. We expect to find lots of colour, hand-made and high quality creations on the catwalk. Junk Weavers Inc ("Saving the Planet one wrapper at a time") is devoted to recycling and up-cycling single used plastic into something marketable. 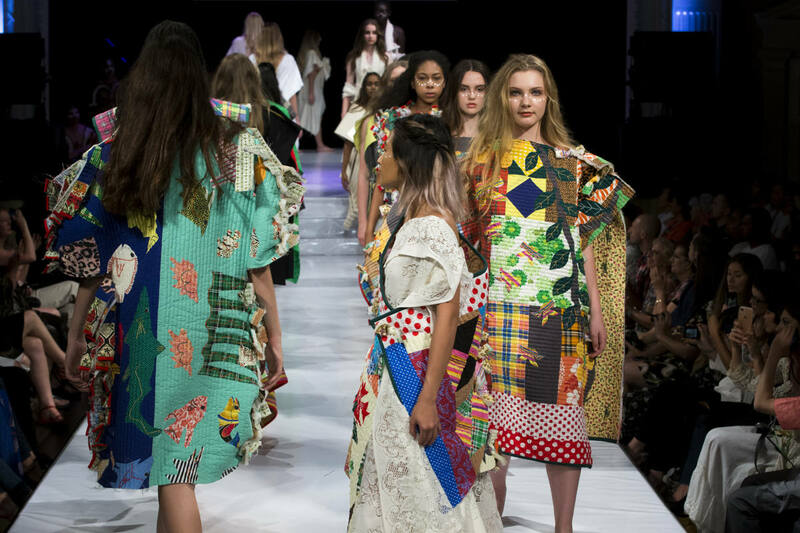 The pieces -made by weaving chip packets, lolly wrappers, dog and cat food biscuit bags and coffee bags- are coming down the runway, where we will also find a collectors item, the Elton John dress, made from concert banners! A must see in out of the box creativity. The Junk Weavers aim to become a world wide leader in teaching recycled crafts! Ren will show clothing that connects you to our mother Earth. "Freedom to be yourself, an awareness of our environment and a solidarity with others". Made from re-claimed linen, cotton and Tencel using up-cycled dead or waste stocks, the new collection is Yaşam, which means “life” in Turkish. The inspiration is “the dream of creating a different life in the Earth.” On the catwalk, we will see eight pieces born from the rawest version of life. Expect Ren signature classic styles, easy proportions and beautiful textures. Fabric of Nature - Mastering shape and form. Known for its recognisable delicate eucalyptus dyed silks which cascade in sheer silhouettes, Fabric by Nature will show this year garments made with a new technique; felted merino wool to transform tops. Betty Spoke is known for her fierce tailoring and tweed with attitude. We want to see her new collection concept, incorporating works from local Bininj artists, fabrics printed in custom colour combinations. Reduce, Reuse and Recycle: this brand creates looks from used mens shirts. The EFWA UpCycling Challenge! Conceiving something unique from thrifted, handmade downs or recycled shirts. Designers make a statement showing signature originality to make lasting impressions. The last show of EFWA 2018 was won by Robert Naoram. His strong design aesthetic conveys emotions, tradition, culture and beauty of hand loom textiles, organic silks and cottons hand woven by artisanal craftspeople from Manipur in India. Design features are intricate embroidery, standout quality and bold colours. The final note of EFWA 2018 reaches crescendo, as a wave of spectacular jewel colours flow down the runway. EFWA Designer Showroom is the perfect finale to an inspiring week. Now you've seen the runway shows, it's the perfect time to view the Showroom. Examine in detail your favourite catwalk pieces. Get up close and personal with the collections. Be captivated by the beauty, innovation and artisan skills shown at EFWA 2018. Choose to wear garments made by trail blazers for trail blazers and lead the fashion pack in sustainable style.